Is it possible to make $400.000 a year from Yoga? YES. Here is how. Is it from teaching classes? No. Most full-time yoga teachers know the struggle of trying to earn a living while doing what they love—it’s not all rainbows and tropical-island handstands. Studio rents are high, profits are dwindling, and while the field is growing (this is a $16 billion industry, after all), it’s highly competitive. “Take-home pay peaks and dips when you’re a yoga instructor, and $400,000 is definitely a peak, but it happens,” she says. “All the cylinders have to be firing; everything has to be going your way.” In other words, it’s not a steady salary by any means, and it’s far from the norm. Still, you want to know how it’s done, right? Here, Taylor reveals the monetary figures usually kept under wraps in the yoga industry—all of which prove that making it big as a yogalebrity is not as easy as it looks on Instagram. According to Taylor, live appearances make up the biggest bucket of revenue. These can be educational (like giving a conference lecture on anatomy or philosophy) or entertaining (such as teaching at a big festival). 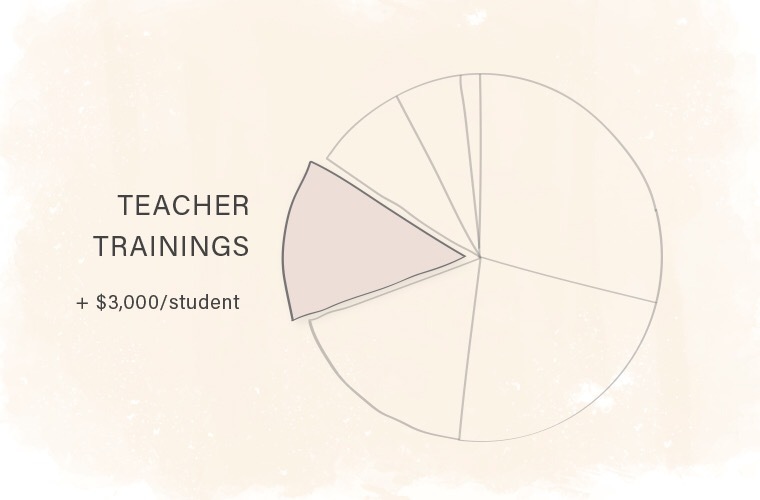 Ever wonder how much those instructors at Wanderlust are making? 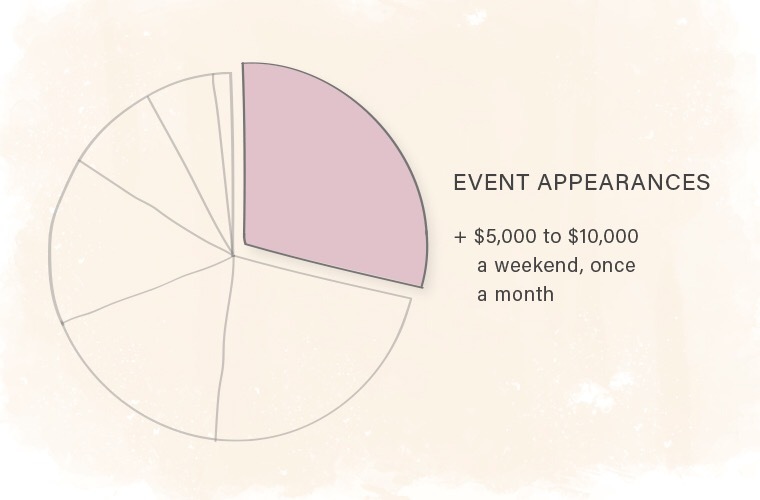 “Someone who is successful in the live event space can make between $5,000 and $10,000 a weekend,” Taylor reveals. 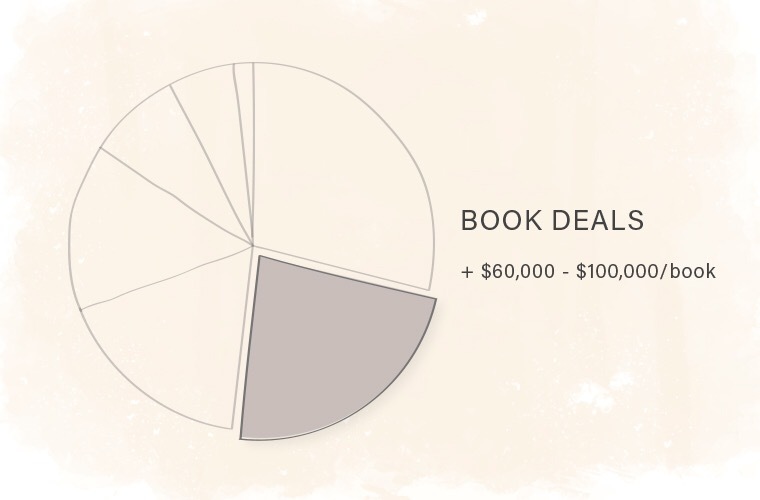 The second-biggest money maker for rockstar yogis: publishing. “This can bring in anywhere from the high five figures to even six figures,” Taylor reveals. Of course, sitting down and writing a book like Guru Jagat’s Invincible Living or Hilaria Baldwin’s The Living Clearly Method isn’t easy—it takes time and talent. But putting in the effort can pay off, big time. This is a biggie. Endorsements are a key income stream for almost every popular sport, and now yogis are getting in on the game. Spot your favorite guru in an Adidas or Under Armour ad? Chances are, she’s getting paid in the high five figures—at times even six figures—for that deal. Sponsored social media posts are another revenue generator many yogis rely on. 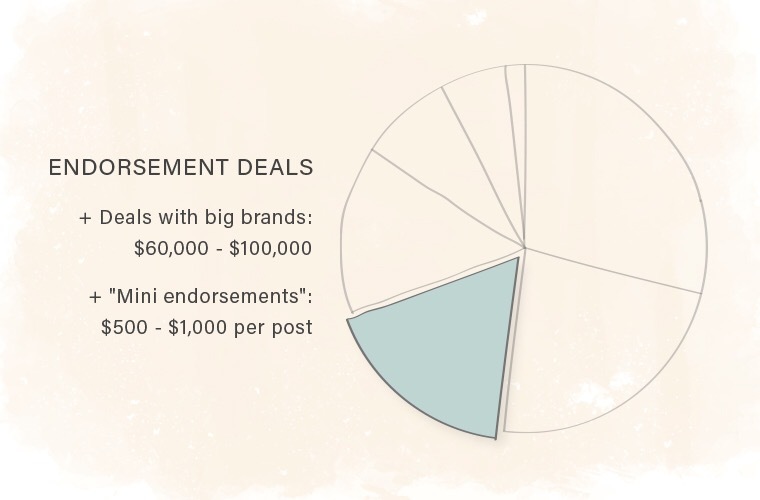 Taylor calls these “mini-endorsements” and says ‘grammers typically make $500 to $1,000 per post. There’s a reason why many so many yogis are launching their own teacher trainings: they’re lucrative. Just multiply that $3,000 cost by 30 students, and you can see how quickly the profits add up. Most people don’t live in a city like New York or Los Angeles with access to the biggest names in yoga. Which is exactly where platforms like Cody and Do You Yoga come in—fans can follow along with their favorite instructor from anywhere in the world, for a nominal fee. And, usually, it’s okay to form partnerships with more than one. 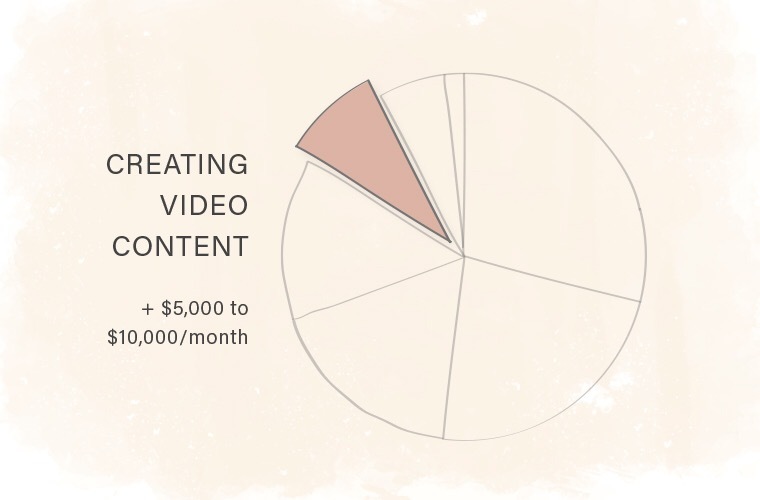 In fact, Taylor tells her clients to work with as many of these digital outlets as possible, while also creating unique paid content on their own website or channel (sometimes with an additional subscription fee). 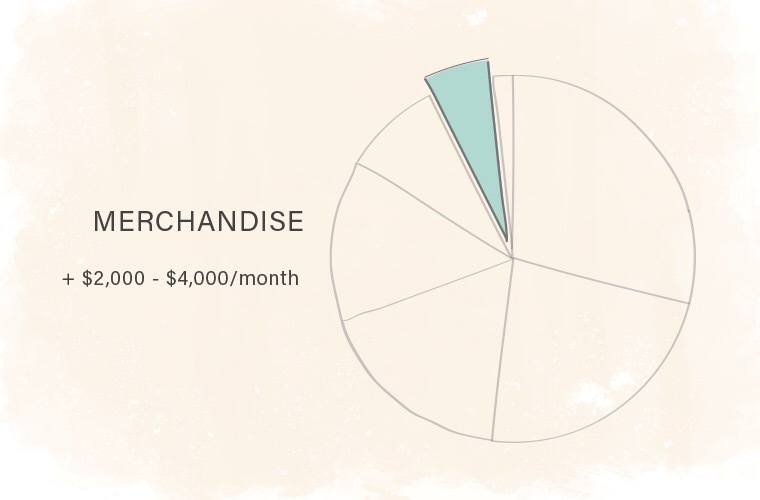 Like Y7’s “Brooklyn We Flow Hard” tees and Sky Ting’s custom totes, branded gear gives fans a way to pledge allegiance to their yoga tribe—and it’s also fairly profitable. “Whether it’s investing in their own custom-made hoodies, bags, and other merchandise, or getting a share of the profits from essential oils and products from other brands sold in-studio, an instructor can make a few thousand dollars a month,” Taylor says. It’s not the key revenue driver, but hey, every thousand’s another step closer to six-figures. It seems crazy that actually teaching classes should be at the bottom of the list, but unfortunately, that just isn’t what brings in the big bucks. (And it’s the reason why the majority of yoga instructors struggle financially.) But that doesn’t mean it’s not important. “All my clients who are making $400,000 [a year], it took them 10 or 15 years to get there,” the agent notes. “They did their time teaching to half-full rooms or making $4 a class.” Like most other careers, it’s all about paying your dues. As as an instructor becomes more successful, Taylor says, she’ll teach less frequently and charge more. 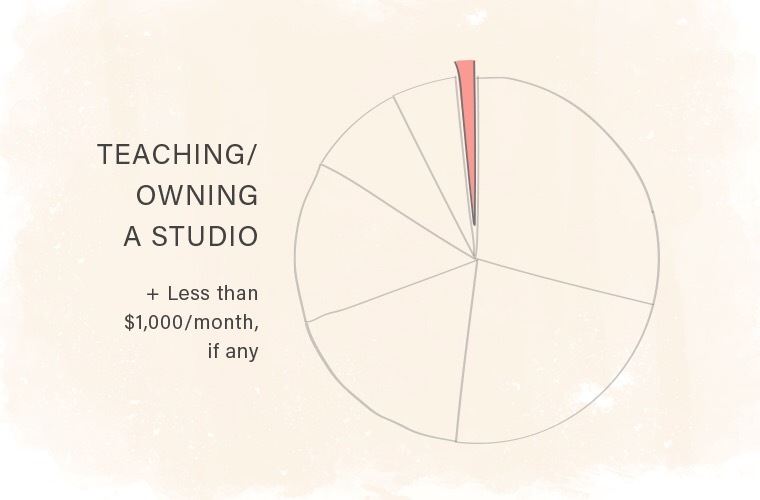 Owning a studio is also not going to bring in a big paycheck. “The costs are just so high,” she adds. Letting go of a space and giving up group classes are major decisions for her clients—but as their followings grow, they choose to shift their focus to large-scale events and appearances. Speaking of yoga, you are definitely going to want to wear these leggings to your next class—especially if it’s with the world’s oldest yogi, AKA the happiest woman ever.